Circus art and craft activities for preschoolers through second grade. I use a plain white sheet and let the children paint on and use it a Big Top tent. we all play and do different circus tricks and entertain each other under the Big Top!! Use white paper and roll up like a cone hat, but small. Take a colored cotton ball and unroll (it Does), and wrap around the cone, use white glue as you wrap. Continue and wrap as big ball as you want. Wrap up and down the cone to form fake cotton candy. It looks real enough to eat. Have the children decorate a paper plate with bingo dippers of different colors, this will be the clown’s collar. Next, blow up a balloon and let them use various materials to make a face, construction paper, tissue paper, etc. Then punch a small hole in the center of the paper plate and pull the balloon through. Secure with tape, staple to the bulletin board. You can add a piece of masking tape to the back of the balloon to get it to stick to the bulletin board so that you can see all of the clown faces, otherwise, the balloons naturally face down! I had all the kids design their own big top circus. They chose where they wanted the ring, people, tent, and other buildings and animals to be. It was great! Give each child two small balls of Styrofoam to create a clown. 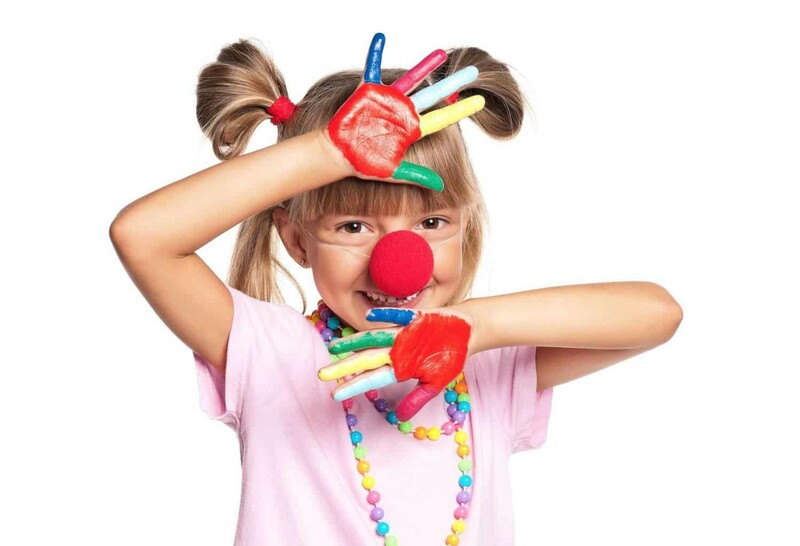 supply them with different kinds of shapes and craft materials to decorate their clown…Let them be creative!. Have fun! We made a circus train to decorate our classroom wall. Each child made one train car, then the cars were joined to form a long train. Begin by getting clean, *unused* Styrofoam meat trays from your grocer. Most will donate these. Next, have each child cut a wild animal picture from a magazine and glue it onto the tray. Cut small slits along the top and bottom of the tray, and provide the children with pieces of yarn. These can be stretch from top to bottom on the tray and will stay in place when the ends are tucked into the slits. These are your cage “bars”. Add construction paper wheels to each train car and combine with a paper engine and caboose for a great wall display! On our train, I also added several passenger cars with photos of the children in clown make-up pasted into the windows! For the circus art project, I thought to make popcorn. Instead of gluing the popcorn on the paper, I knew my very young class of 3-year-olds would want to eat their share of the popcorn. So, I let them decorate brown paper lunch bags with the “Dot Art” paint (but you can use anything) and fill their bag with a handful of popcorn. We made big top tents out of red construction paper (less than 1/2 of an 8 1/2 x 11 sheet worked and cut to look like a tent), then I cut a slit up the middle and folded back the side to form the tent entrance. Then we glued them to a piece of sturdy white paper 8 1/2 x 11 and added stickers for the animals, drew clowns on the paper or a picture of the kids going to the circus and added a sun and sky. To finish it off we took a flag cut out of yellow construction paper, glued it at the top of the tent and wrote our names on the flag. They also took white crayons and made strips or decorations on the tent. WAY CUTE!! Have the children cut out a circle and add features of a clown face. You may put on a red nose, silly mouth etc. Get creative. For the hair, have the children dip their hands in orange paint. Place their hands on both sides of the clowns head for hair. We had a circus day and painted the children’s faces, they made cone-shaped hats, by wrapping a large piece of decorated paper into a cone and fastening with staples or tape. Then we made clown noses out of egg carton cups, painted red, and held on with sewing elastic thread. we then made popcorn for a snack. It was great fun!